Thatched roofs, beamed ceilings and spectacular views of Mt. Mismi from its Colca River setting – this upscale option adds in plenty of rustic charm. It’s all surrounded by valley slopes terraced into unique agricultural steps by an ancient, pre-Incan civilisation. And, drawing inspiration from its setting, the Colca Lodge is built from local earth and stone, with rooms spilling onto curated gardens. There are even four natural hot springs at the hotel to relax in. All of the rooms enjoy delightful views of the valley and the hotel’s gardens, inviting in the region’s traditional style with adobe walls and thatched roofs. Many are even heated by stone slabs warmed by the region’s geothermal power. The suites are a highlight for their private terraces. And, don’t worry, despite the rustic styling, WiFi is available throughout. While all the massages and beauty treatments of a standard spa are available here, it’s the hot pools that truly stand out. 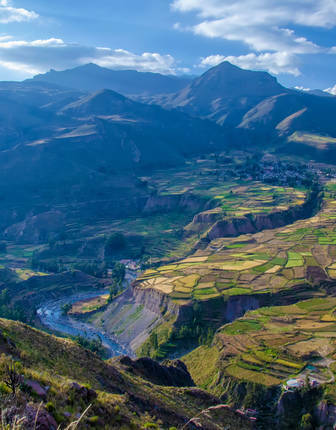 Mist-clad and set to yet more impressive views over the Colca Valley, they’re delightfully evocative, especially when enjoyed with a glass of South American wine. Speaking of indulging, you might want to cap off your day’s exploration with a drink at the bar and dinner at the restaurant. Expect perfectly barbequed meats, local river trout and traditional Andean cooking. However, you’ll also want to explore. There’s plenty of active adventure to be had here, with hikes bringing you among high-altitude peaks and bike rides bringing you along the valley floor. Alongside the national-treasure terraces, there’s also the chance to spot alpacas and that great Peruvian icon – the condor. From natural treasures to ancient wonders and Spanish cities, this itinerary links together the highlights of Peru with luxury stays, private tours and flight hops included throughout.